Russian intermediate range ballistic missile. The Soviet R-2 ballistic missile was developed in 1947-1953, nearly in parallel with the R-1 from which it derived. It incorporated many detailed improvements, had double the range of the R-1 and V-2, and was equipped with a deadly radiological warhead. The ethyl alcohol used in the V-2 and R-1 was replaced by methyl alcohol in the R-2, eliminating the problem of the launch troops drinking up the rocket fuel. Versions of the R-2 for suborbital manned flight were studied by Korolev in 1956-1958, but it was decided instead to move directly to orbital flights of the Vostok. However some equipment tested on the R-2 found its way onto canine flights of Sputnik and Vostok. The R-2 design was transferred to China in 1957 to 1961, providing the technical basis of the Chinese rocket industry. AKA: 8Zh38;Sibling;SS-2. Status: Retired 1962. First Launch: 1950-10-01. Last Launch: 1961-09-01. Number: 221 . Payload: 570 kg (1,250 lb). Thrust: 364.90 kN (82,033 lbf). Gross mass: 20,091 kg (44,293 lb). Height: 17.68 m (58.00 ft). Diameter: 1.83 m (6.00 ft). Span: 4.27 m (14.00 ft). Apogee: 150 km (90 mi). The German engineers at Zentralwerke had already begun development of an improved V-2 engine in 1945. Through relatively simple measures the thrust was increased to 30 metric tons. Glushko then found that by using 96% alcohol fuel in place of the V-2's 75%, the basic engine would deliver 37 metric tons thrust. Experimental tests of these tweaked V-2 and all-Russian RD-100 engines were conducted in 1948 - 1949. Official state trials tests were conducted at Zagorsk in 1950. The R-2 was designed by Korolev in 1947-1948 in competition with Groettrup's G-1. Korolev's approach was to apply simple measures to double the range of the V-2. The increased-thrust engine allowed the rocket to be stretched, with a lift-off mass 50% greater than the V-2. When the G-1 and R-2 were evaluated by the State Commission in December 1948, the G-1 was found the superior design. Korolev fought the decision for a long time, updating his R-2 design to include some of the G-1's features, such as the use of an integral fuel tank, and improved accuracy through a radio-controlled engine cut-off system (russified by Mikhail Borisenko). Finally the decision was reversed and Korolev's design was accepted for test. State trials flights were conducted from 21 September 1949 to July 1951. Barmin had already designed the mobile launch complex to accommodate either the R-1 or R-2 missiles. The system was accepted into the military on 27 November 1951. A 30 November 1951 decree authorized series production at factory 586 at Dnepropetrovsk. The first launch by a military unit was made with a prototype rocket in 1952. The first production rocket was rolled out there in June 1953 (only six months after the first all-Dnepropetrovsk R-1). The gruesome Geran radiological warhead was developed for use with the R-2. This dispersed a radioactive liquid at altitude, resulting in a deadly 'radioactive rain' falling in a wide area around the impact point. R-2's were deployed in rocket brigades equipped with six launchers (three divisions per brigade, each division with two batteries). The 54th and 56th brigades were formed for test launches at Kapustin Yar on 1 June 1952. Following receipt of production missiles in 1953, divisions were deployed to Zhitomir; Kolomiya; Medved, Novgorod oblast; Kamyshin, Volgograd oblast; Siauliai, Lithuania; Dzhambul, Kazakhstan; and Ordzhonikidze, in the Far East. In field use a crew of 11 was required for launch preparations. The radio-correction system required two truck-mounted stations. It took six hours to prepare the rocket for launch, including 15 minutes for the guidance system to be programmed. Once prepared, the rocket could be held in a ready-to-launch condition for 24 hours before it had to be defueled and recycled. The rocket was launched in service at temperatures from -40 deg C to +50 deg C, and at wind speeds of up to 15 m/s. On 6 December 1957 an agreement was signed to license production of the R-2 to China. A huge team of Russian rocket engineers and technicians went to Beijing to set up the production line. 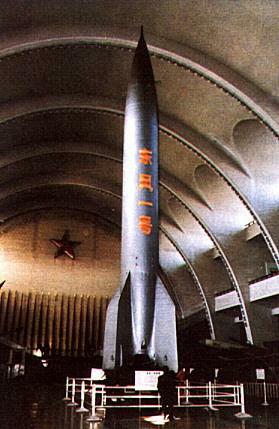 This rocket provided the technological base for the subsequent Chinese rocket programs. R-2E: Prototype rocket with characteristics of both the R-1 and R-2 used to test the integral fuel tank and separable warhead planned for the production R-2 missile. R-2R: Evidently used to test the advanced radio controlled cut-off system being developed for the R-3. However this may also just identify certain R-2A flights with this payload. No launch dates conclusively known. R-2A: This was the main variant for scientific work, used to continue the experiment series of the R-1 to a height of 200 kilometers. Instruments were carried to study the atmosphere over 150 km; ultra-violet observation of the sun; ultra-violet astronomy; the ionosphere; and recovery of biological payloads (dogs and rabbits) from double the altitude of the R-1. Technical details: Payload 1350 / 508 kg. Range 550 km (576 km in R-2E version). Maximum altitude 171 km. Time of flight 7.5 minutes. Max velocity at burnout 2175 m/s. Accuracy 8 km in range, 4 km laterally. The R-2A version could carry 1400 kg on a 209 km vertical shot. Maximum range: 550 km (340 mi). Number Standard Warheads: 1. CEP: 6.94 km (4.31 mi). 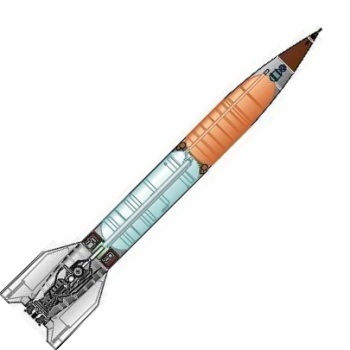 Boost Propulsion: Storable liquid rocket, Lox/.92 Alcohol. Maximum speed: 7,850 kph (4,870 mph). Initial Operational Capability: 1958. Stage 1. 1 x R-2. Gross Mass: 19,632 kg (43,281 lb). Empty Mass: 4,592 kg (10,123 lb). Thrust (vac): 404.112 kN (90,848 lbf). Isp: 237 sec. Burn time: 85 sec. Isp(sl): 214 sec. Diameter: 1.65 m (5.42 ft). Span: 3.56 m (11.69 ft). Length: 17.65 m (57.90 ft). Propellants: Lox/Alcohol. No Engines: 1. Engine: RD-101. Other designations: 8Zh38. Status: Out of Production. Comments: Payload 1350 / 508 kg. Range 550 km. Maximum altitude 171 km. Time of flight 7.5 minutes. Max velocity at burnout 2175 m/s. Accuracy 8 km in range, 4 km laterally. Family: IRBM. Country: Russia. Engines: RD-101. Launch Sites: Kapustin Yar, Kapustin Yar SP-2, Jiuquan, Jiuquan LA3, Kapustin Yar V-2. Stages: R-2 stage. Agency: Korolev bureau. Bibliography: 2, 283, 344, 474, 476, 89. 1950 October 1 - . Launch Site: Kapustin Yar. Launch Complex: Kapustin Yar V-2. LV Family: V-2. Launch Vehicle: R-2. FAILURE: Failed to reach target. First series test launch - . Nation: Russia. Agency: Korolev bureau. Apogee: 150 km (90 mi). First launch to full range..
1950 October 1 - . Launch Site: Kapustin Yar. Launch Complex: Kapustin Yar V-2. LV Family: V-2. Launch Vehicle: R-2. First series test launch - . Nation: Russia. Agency: Korolev bureau. Apogee: 150 km (90 mi). 1950 October 21 - . Launch Site: Kapustin Yar. Launch Complex: Kapustin Yar V-2. LV Family: V-2. Launch Vehicle: R-2. First series test launch - . Nation: Russia. Agency: Korolev bureau. Apogee: 150 km (90 mi). First launch in first test series of protoype missiles..
1950 November 1 - . Launch Site: Kapustin Yar. Launch Complex: Kapustin Yar V-2. LV Family: V-2. Launch Vehicle: R-2. 1950 December 1 - . Launch Site: Kapustin Yar. Launch Complex: Kapustin Yar V-2. LV Family: V-2. Launch Vehicle: R-2. 1950 December 20 - . Launch Site: Kapustin Yar. Launch Complex: Kapustin Yar V-2. LV Family: V-2. Launch Vehicle: R-2. FAILURE: Failed to reach target. First series test launch - . Nation: Russia. Agency: Korolev bureau. Apogee: 150 km (90 mi). Twelfth and final launch in prototype test series. All missiles failed to reach targets..
1951 July 1 - . Launch Site: Kapustin Yar. Launch Complex: Kapustin Yar V-2. LV Family: V-2. Launch Vehicle: R-2. Second series test launch - . Nation: Russia. Agency: Korolev bureau. Apogee: 150 km (90 mi). 1951 July 2 - . Launch Site: Kapustin Yar. Launch Complex: Kapustin Yar V-2. LV Family: V-2. Launch Vehicle: R-2. Second series test launch - . Nation: Russia. Agency: Korolev bureau. Apogee: 150 km (90 mi). First launch in second test series..
1951 July 27 - . Launch Site: Kapustin Yar. Launch Complex: Kapustin Yar V-2. LV Family: V-2. Launch Vehicle: R-2. Second series test launch - . Nation: Russia. Agency: Korolev bureau. Apogee: 150 km (90 mi). Thirteenth and last launch of the second series. 12 of the 13 reached their targets..
1951 November 27 - . LV Family: V-2. Launch Vehicle: R-2. R-2 accepted for military service. - . Nation: Russia. Council of Soviet Ministers (SM) Decree 4972-2096 'On adoption of the R-2 into armaments' was issued..
1951 November 30 - . LV Family: V-2. Launch Vehicle: R-2. R-2 production authorised. - . Nation: Russia. Ministry of Armaments Decree 'On starting of series production of the R-2 at Dnepropetrovsk Plant No. 586' was issued. The first launch by a military unit was made with a prototype rocket in 1952..
1952 June 1 - . LV Family: V-2. Launch Vehicle: R-2. R-2 test brigades organised - . Nation: Russia. The 54th and 56th brigades were formed for test launches at Kapustin Yar. R-2's were deployed in rocket brigades equipped with six launchers (three divisions per brigade, each division with two batteries)..
1952 August 1 - . Launch Site: Kapustin Yar. Launch Complex: Kapustin Yar V-2. LV Family: V-2. Launch Vehicle: R-2. Third series controlled test launch - . Nation: Russia. Agency: Korolev bureau. Apogee: 150 km (90 mi). 1952 August 8 - . Launch Site: Kapustin Yar. Launch Complex: Kapustin Yar V-2. LV Family: V-2. Launch Vehicle: R-2. Third series controlled test launch - . Nation: Russia. Agency: Korolev bureau. Apogee: 150 km (90 mi). First launch of production quality assurance test series..
1952 September 1 - . Launch Site: Kapustin Yar. Launch Complex: Kapustin Yar V-2. LV Family: V-2. Launch Vehicle: R-2. 1952 September 18 - . Launch Site: Kapustin Yar. Launch Complex: Kapustin Yar V-2. LV Family: V-2. Launch Vehicle: R-2. Third series controlled test launch - . Nation: Russia. Agency: Korolev bureau. Apogee: 150 km (90 mi). 14th and last launch in quality assurance testing. 12 of the 14 reached their targets..
1953 June - . LV Family: V-2. Launch Vehicle: R-2. First R-2 production delivery - . Nation: Russia. The first production rocket was rolled out at Dnepropetrovsk (only six months after the first all-Dnepropetrovsk R-1). Following receipt of production missiles, divisions were deployed to Zhitomir; Kolomoaya; Medved, Novgorod oblast; Kamyshin, Volgograd oblast; Shyalya, Lithuania; Dzhambul, Kazakhstan; and Ordzhonikidze, in the Far East. 1953 October 1 - . Launch Site: Kapustin Yar. Launch Complex: Kapustin Yar V-2. LV Family: V-2. Launch Vehicle: R-2. 1953 October 10 - . Launch Site: Kapustin Yar. Launch Complex: Kapustin Yar V-2. LV Family: V-2. Launch Vehicle: R-2. 1953 October 24 - . Launch Site: Kapustin Yar. LV Family: V-2. Launch Vehicle: R-2. NII-88 Production - . Nation: Russia. Apogee: 100 km (60 mi). 1954 May 1 - . Launch Site: Kapustin Yar. Launch Complex: Kapustin Yar V-2. LV Family: V-2. Launch Vehicle: R-2. NII-88 Production - . Nation: Russia. Agency: Korolev bureau. Apogee: 150 km (90 mi). First production series test launch. - . Nation: Russia. Agency: Korolev bureau. Apogee: 150 km (90 mi). First launch of series production missile..
First production series test launch. - . Nation: Russia. Agency: Korolev bureau. Apogee: 150 km (90 mi). NII-88 Production - . Nation: Russia. Agency: Korolev bureau. Apogee: 150 km (90 mi). 10th and last launch in production missile series, 8 successes. 1954 June 1 - . Launch Site: Kapustin Yar. Launch Complex: Kapustin Yar V-2. LV Family: V-2. Launch Vehicle: R-2. 1954 June 8 - . Launch Site: Kapustin Yar. LV Family: V-2. Launch Vehicle: R-2. ZAV586 Prod GIM-2 - . Nation: Russia. Apogee: 150 km (90 mi). 1954 June 9 - . Launch Site: Kapustin Yar. LV Family: V-2. Launch Vehicle: R-2. 1954 July 22 - . Launch Site: Kapustin Yar. LV Family: V-2. Launch Vehicle: R-2. UGCh - . Nation: Russia. Apogee: 150 km (90 mi). 1954 September 30 - . Launch Site: Kapustin Yar. LV Family: V-2. Launch Vehicle: R-2. 1954 October 1 - . Launch Site: Kapustin Yar. LV Family: V-2. Launch Vehicle: R-2. 1954 October 5 - . Launch Site: Kapustin Yar. LV Family: V-2. Launch Vehicle: R-2. 1954 October 16 - . Launch Site: Kapustin Yar. LV Family: V-2. Launch Vehicle: R-2. 1954 November 27 - . Launch Site: Kapustin Yar. LV Family: V-2. Launch Vehicle: R-2. 1954 December 1 - . Launch Site: Kapustin Yar. LV Family: V-2. Launch Vehicle: R-2. Generator-2 - . Nation: Russia. Apogee: 150 km (90 mi). 1954 December 6 - . Launch Site: Kapustin Yar. LV Family: V-2. Launch Vehicle: R-2. 1954 December 9 - . Launch Site: Kapustin Yar. LV Family: V-2. Launch Vehicle: R-2. 1954 December 23 - . Launch Site: Kapustin Yar. LV Family: V-2. Launch Vehicle: R-2. 1954 December 25 - . Launch Site: Kapustin Yar. LV Family: V-2. Launch Vehicle: R-2. Generator-2 - . Nation: Russia. Apogee: 30 km (18 mi). 1955 January 4 - . Launch Site: Kapustin Yar. LV Family: V-2. Launch Vehicle: R-2. Generator-2 - . Nation: Russia. Apogee: 150 km (90 mi). At least one R-2 flown in January 1955 as R-2R for R-3 development work..
1955 January 15 - . Launch Site: Kapustin Yar. LV Family: V-2. Launch Vehicle: R-2. 1955 January 25 - . Launch Site: Kapustin Yar. LV Family: V-2. Launch Vehicle: R-2. 1955 January 31 - . Launch Site: Kapustin Yar. LV Family: V-2. Launch Vehicle: R-2. 1955 February 8 - . Launch Site: Kapustin Yar. LV Family: V-2. Launch Vehicle: R-2. 1955 February 25 - . Launch Site: Kapustin Yar. LV Family: V-2. Launch Vehicle: R-2. 1955 February 28 - . Launch Site: Kapustin Yar. LV Family: V-2. Launch Vehicle: R-2. 1955 March 1 - . Launch Site: Kapustin Yar. LV Family: V-2. Launch Vehicle: R-2. 1955 March 2 - . Launch Site: Kapustin Yar. LV Family: V-2. Launch Vehicle: R-2. UGCh - . Nation: Russia. Apogee: 15 km (9 mi). 1955 March 21 - . Launch Site: Kapustin Yar. LV Family: V-2. Launch Vehicle: R-2. 1955 April 4 - . Launch Site: Kapustin Yar. LV Family: V-2. Launch Vehicle: R-2. 1955 May 18 - . Launch Site: Kapustin Yar. LV Family: V-2. Launch Vehicle: R-2. 1955 May 20 - . Launch Site: Kapustin Yar. LV Family: V-2. Launch Vehicle: R-2. 1955 May 28 - . Launch Site: Kapustin Yar. LV Family: V-2. Launch Vehicle: R-2. 1955 May 31 - . Launch Site: Kapustin Yar. LV Family: V-2. Launch Vehicle: R-2. 1955 June 1 - . Launch Site: Kapustin Yar. LV Family: V-2. Launch Vehicle: R-2. 1955 June 20 - . Launch Site: Kapustin Yar. LV Family: V-2. Launch Vehicle: R-2. 1955 June 28 - . Launch Site: Kapustin Yar. LV Family: V-2. Launch Vehicle: R-2. 1955 July 1 - . Launch Site: Kapustin Yar. Launch Complex: Kapustin Yar V-2. LV Family: V-2. Launch Vehicle: R-2. 1955 July 15 - . Launch Site: Kapustin Yar. LV Family: V-2. Launch Vehicle: R-2. 1955 July 26 - . Launch Site: Kapustin Yar. LV Family: V-2. Launch Vehicle: R-2. 1955 August 1 - . Launch Site: Kapustin Yar. Launch Complex: Kapustin Yar V-2. LV Family: V-2. Launch Vehicle: R-2. 1955 August 3 - . Launch Site: Kapustin Yar. LV Family: V-2. Launch Vehicle: R-2. 1955 August 6 - . Launch Site: Kapustin Yar. LV Family: V-2. Launch Vehicle: R-2. 1955 August 8 - . Launch Site: Kapustin Yar. LV Family: V-2. Launch Vehicle: R-2. 1955 August 24 - . Launch Site: Kapustin Yar. LV Family: V-2. Launch Vehicle: R-2. 1955 August 27 - . Launch Site: Kapustin Yar. LV Family: V-2. Launch Vehicle: R-2. 1955 August 30 - . Launch Site: Kapustin Yar. LV Family: V-2. Launch Vehicle: R-2. 1955 August 31 - . Launch Site: Kapustin Yar. LV Family: V-2. Launch Vehicle: R-2. 1955 September 29 - . Launch Site: Kapustin Yar. LV Family: V-2. Launch Vehicle: R-2. 1955 October 1 - . Launch Site: Kapustin Yar. LV Family: V-2. Launch Vehicle: R-2. 1955 October 31 - . Launch Site: Kapustin Yar. LV Family: V-2. Launch Vehicle: R-2. 1955 November 19 - . Launch Site: Kapustin Yar. LV Family: V-2. Launch Vehicle: R-2. 1955 November 23 - . Launch Site: Kapustin Yar. LV Family: V-2. Launch Vehicle: R-2. 1955 December 16 - . Launch Site: Kapustin Yar. LV Family: V-2. Launch Vehicle: R-2. 1955 December 17 - . Launch Site: Kapustin Yar. LV Family: V-2. Launch Vehicle: R-2. 1955 December 24 - . Launch Site: Kapustin Yar. LV Family: V-2. Launch Vehicle: R-2. 1955 December 27 - . Launch Site: Kapustin Yar. LV Family: V-2. Launch Vehicle: R-2. 1955 December 28 - . Launch Site: Kapustin Yar. LV Family: V-2. Launch Vehicle: R-2. 1955 December 30 - . Launch Site: Kapustin Yar. LV Family: V-2. Launch Vehicle: R-2. 1956 February 17 - . Launch Site: Kapustin Yar. LV Family: V-2. Launch Vehicle: R-2. 1956 March 9 - . Launch Site: Kapustin Yar. LV Family: V-2. Launch Vehicle: R-2. 1956 April 29 - . Launch Site: Kapustin Yar. LV Family: V-2. Launch Vehicle: R-2. 1956 May 8 - . Launch Site: Kapustin Yar. LV Family: V-2. Launch Vehicle: R-2. 1956 July 12 - . Launch Site: Kapustin Yar. LV Family: V-2. Launch Vehicle: R-2. 1956 July 28 - . Launch Site: Kapustin Yar. LV Family: V-2. Launch Vehicle: R-2. 1956 September 29 - . Launch Site: Kapustin Yar. LV Family: V-2. Launch Vehicle: R-2. 1956 October 25 - . Launch Site: Kapustin Yar. LV Family: V-2. Launch Vehicle: R-2. 1956 November 3 - . Launch Site: Kapustin Yar. LV Family: V-2. Launch Vehicle: R-2. 1957 February 28 - . Launch Site: Kapustin Yar. LV Family: V-2. Launch Vehicle: R-2. 1957 May 29 - . Launch Site: Kapustin Yar. LV Family: V-2. Launch Vehicle: R-2. 1957 June 5 - . Launch Site: Kapustin Yar. LV Family: V-2. Launch Vehicle: R-2. 1957 June 7 - . Launch Site: Kapustin Yar. LV Family: V-2. Launch Vehicle: R-2. 1957 July 7 - . Launch Site: Kapustin Yar. Launch Complex: Kapustin Yar SP-2. LV Family: V-2. Launch Vehicle: R-2. 1957 July 9 - . Launch Site: Kapustin Yar. LV Family: V-2. Launch Vehicle: R-2. 1957 July 10 - . Launch Site: Kapustin Yar. LV Family: V-2. Launch Vehicle: R-2. 1957 July 18 - . Launch Site: Kapustin Yar. LV Family: V-2. Launch Vehicle: R-2. 1957 July 19 - . Launch Site: Kapustin Yar. LV Family: V-2. Launch Vehicle: R-2. 1957 July 22 - . Launch Site: Kapustin Yar. Launch Complex: Kapustin Yar SP-2. LV Family: V-2. Launch Vehicle: R-2. 1957 July 24 - . Launch Site: Kapustin Yar. Launch Complex: Kapustin Yar SP-2. LV Family: V-2. Launch Vehicle: R-2. 1957 July 29 - . Launch Site: Kapustin Yar. Launch Complex: Kapustin Yar SP-2. LV Family: V-2. Launch Vehicle: R-2. 1957 August 5 - . Launch Site: Kapustin Yar. Launch Complex: Kapustin Yar SP-2. LV Family: V-2. Launch Vehicle: R-2. 1957 August 6 - . Launch Site: Kapustin Yar. Launch Complex: Kapustin Yar SP-2. LV Family: V-2. Launch Vehicle: R-2. 1957 August 7 - . Launch Site: Kapustin Yar. LV Family: V-2. Launch Vehicle: R-2. 1957 August 8 - . Launch Site: Kapustin Yar. LV Family: V-2. Launch Vehicle: R-2. 1957 August 20 - . Launch Site: Kapustin Yar. LV Family: V-2. Launch Vehicle: R-2. 1957 August 22 - . Launch Site: Kapustin Yar. LV Family: V-2. Launch Vehicle: R-2. 1957 August 23 - . Launch Site: Kapustin Yar. LV Family: V-2. Launch Vehicle: R-2. 1957 August 27 - . Launch Site: Kapustin Yar. LV Family: V-2. Launch Vehicle: R-2. 1957 September 21 - . Launch Site: Urda. LV Family: V-2. Launch Vehicle: R-2. Tactical launcher - . Nation: Russia. Apogee: 150 km (90 mi). 1957 September 22 - . Launch Site: Urda. LV Family: V-2. Launch Vehicle: R-2. 1957 September 23 - . Launch Site: Urda. LV Family: V-2. Launch Vehicle: R-2. 1957 September 29 - . Launch Site: Urda. LV Family: V-2. Launch Vehicle: R-2. 1957 September 30 - . Launch Site: Urda. LV Family: V-2. Launch Vehicle: R-2. 1957 October 1 - . Launch Site: Urda. LV Family: V-2. Launch Vehicle: R-2. 1957 October 2 - . Launch Site: Urda. LV Family: V-2. Launch Vehicle: R-2. 1957 October 12 - . Launch Site: Kapustin Yar. LV Family: V-2. Launch Vehicle: R-2. 1957 October 13 - . Launch Site: Kapustin Yar. LV Family: V-2. Launch Vehicle: R-2. 1957 October 26 - . Launch Site: Kapustin Yar. LV Family: V-2. Launch Vehicle: R-2. 1957 October 27 - . Launch Site: Kapustin Yar. LV Family: V-2. Launch Vehicle: R-2. 1957 November 4 - . Launch Site: Kapustin Yar. LV Family: V-2. Launch Vehicle: R-2. 1958 January 17 - . Launch Site: Kapustin Yar. LV Family: V-2. Launch Vehicle: R-2. 1958 February 20 - . Launch Site: Kapustin Yar. LV Family: V-2. Launch Vehicle: R-2. 1958 July 4 - . Launch Site: Kapustin Yar. LV Family: V-2. Launch Vehicle: R-2. 1958 July 8 - . Launch Site: Kapustin Yar. LV Family: V-2. Launch Vehicle: R-2. 1958 July 15 - . Launch Site: Kapustin Yar. LV Family: V-2. Launch Vehicle: R-2. 1958 July 29 - . Launch Site: Kapustin Yar. LV Family: V-2. Launch Vehicle: R-2. 1958 July 31 - . Launch Site: Kapustin Yar. Launch Complex: Kapustin Yar SP-2. LV Family: V-2. Launch Vehicle: R-2. NIIP-A target - . Nation: Russia. Agency: Korolev bureau. Apogee: 100 km (60 mi). 1958 August 7 - . Launch Site: Kapustin Yar. Launch Complex: Kapustin Yar SP-2. LV Family: V-2. Launch Vehicle: R-2. 1958 August 17 - . Launch Site: Kapustin Yar. Launch Complex: Kapustin Yar SP-2. LV Family: V-2. Launch Vehicle: R-2. 1958 August 27 - . Launch Site: Kapustin Yar. Launch Complex: Kapustin Yar SP-2. LV Family: V-2. Launch Vehicle: R-2. 1958 September 1 - . Launch Site: Kapustin Yar. LV Family: V-2. Launch Vehicle: R-2. 1958 September 8 - . Launch Site: Kapustin Yar. LV Family: V-2. Launch Vehicle: R-2. 1958 September 13 - . Launch Site: Kapustin Yar. LV Family: V-2. Launch Vehicle: R-2. 1958 September 16 - . Launch Site: Kapustin Yar. LV Family: V-2. Launch Vehicle: R-2. 1958 October 15 - . Launch Site: Kapustin Yar. Launch Complex: Kapustin Yar SP-2. LV Family: V-2. Launch Vehicle: R-2. 1959 January 29 - . Launch Site: Kapustin Yar. LV Family: V-2. Launch Vehicle: R-2. 1959 April 7 - . Launch Site: Kapustin Yar. LV Family: V-2. Launch Vehicle: R-2. 1959 April 9 - . Launch Site: Kapustin Yar. LV Family: V-2. Launch Vehicle: R-2. Zvezda - . Nation: Russia. Agency: RVSN. Apogee: 500 km (310 mi). 1959 April 24 - . Launch Site: Kapustin Yar. LV Family: V-2. Launch Vehicle: R-2. 1959 April 28 - . Launch Site: Kapustin Yar. LV Family: V-2. Launch Vehicle: R-2. 1959 April 29 - . Launch Site: Kapustin Yar. LV Family: V-2. Launch Vehicle: R-2. 1959 May 4 - . Launch Site: Kapustin Yar. LV Family: V-2. Launch Vehicle: R-2. 1959 May 13 - . Launch Site: Kapustin Yar. LV Family: V-2. Launch Vehicle: R-2. 1959 May 18 - . Launch Site: Kapustin Yar. LV Family: V-2. Launch Vehicle: R-2. 1959 May 21 - . Launch Site: Kapustin Yar. LV Family: V-2. Launch Vehicle: R-2. 1959 May 22 - . Launch Site: Kapustin Yar. LV Family: V-2. Launch Vehicle: R-2. 1959 June 1 - . Launch Site: Kapustin Yar. LV Family: V-2. Launch Vehicle: R-2. 1959 June 5 - . Launch Site: Kapustin Yar. LV Family: V-2. Launch Vehicle: R-2. 1959 June 6 - . Launch Site: Kapustin Yar. LV Family: V-2. Launch Vehicle: R-2. 1959 June 11 - . Launch Site: Kapustin Yar. LV Family: V-2. Launch Vehicle: R-2. 1959 June 15 - . Launch Site: Kapustin Yar. LV Family: V-2. Launch Vehicle: R-2. 1959 June 16 - . Launch Site: Kapustin Yar. LV Family: V-2. Launch Vehicle: R-2. 1959 July 3 - . Launch Site: Kapustin Yar. LV Family: V-2. Launch Vehicle: R-2. 1959 July 8 - . Launch Site: Kapustin Yar. LV Family: V-2. Launch Vehicle: R-2. 1959 July 9 - . Launch Site: Kapustin Yar. LV Family: V-2. Launch Vehicle: R-2. 1959 July 13 - . Launch Site: Kapustin Yar. LV Family: V-2. Launch Vehicle: R-2. 1959 July 14 - . Launch Site: Kapustin Yar. LV Family: V-2. Launch Vehicle: R-2. 1959 July 16 - . Launch Site: Kapustin Yar. LV Family: V-2. Launch Vehicle: R-2. 1959 July 20 - . Launch Site: Kapustin Yar. LV Family: V-2. Launch Vehicle: R-2. 1959 November 20 - . Launch Site: Kapustin Yar. LV Family: V-2. Launch Vehicle: R-2. 1959 November 26 - . Launch Site: Kapustin Yar. LV Family: V-2. Launch Vehicle: R-2. 1959 November 27 - . Launch Site: Kapustin Yar. LV Family: V-2. Launch Vehicle: R-2. 1959 November 28 - . Launch Site: Kapustin Yar. LV Family: V-2. Launch Vehicle: R-2. Nation: Russia. Agency: RVSN. Apogee: 20 km (12 mi). 1959 December 23 - . Launch Site: Kapustin Yar. LV Family: V-2. Launch Vehicle: R-2. 1959 December 24 - . Launch Site: Kapustin Yar. LV Family: V-2. Launch Vehicle: R-2. 1959 December 25 - . Launch Site: Kapustin Yar. LV Family: V-2. Launch Vehicle: R-2. 1959 December 28 - . Launch Site: Kapustin Yar. LV Family: V-2. Launch Vehicle: R-2. 1961 Sep - . Launch Site: Kapustin Yar. LV Family: V-2. Launch Vehicle: R-2. R-16 training - . Nation: Russia. Agency: GURVO. Apogee: 100 km (60 mi).